Is a question I am commonly asked. (In fact, I should probably add it to my FAQ page) The truth is, packing for a long trip (3 weeks or more) is pretty easy. Step 1: Open suitcase. Step 2: Pack everything. Step 3: Hope suitcase closes. I kid you not. I have more packing anxiety over a week long trip than any of my three-plus week adventures. With short trips you have to plan outfits. I'm always left wondering, "what if it rains?" "what if I don't feel like wearing this" "what if I spill on myself?" Long trips are easy, you just open your suitcase and throw everything in. Well, at least everything that is current season and meets the needs of your trip. Three weeks in Augusta for business, I'd pack all my in-season work clothes, and a couple of pairs of work shoes plus a few pairs of jeans and a couple of t-shirts for the weekends. Easy! Its also pretty comforting to know that if I forget to pack anything (socks and contact solution are two of my most commonly forgotten items), there is always a Target. Love me some Tar-jay. This trip is a little more complicated. I need to pack clothes for 85 degree weather. Its January. In Iowa. I have forgotten what 85 degree weather looks like, and need to pull out clothes from last summer to pack. 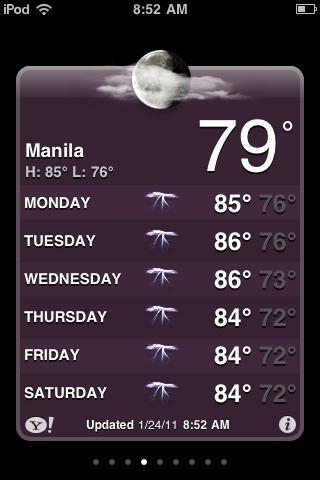 Also - no Target in Manila. So I new this trip would require a little more planning than I'm used to. Okay, any planning would be more than I'm used to. 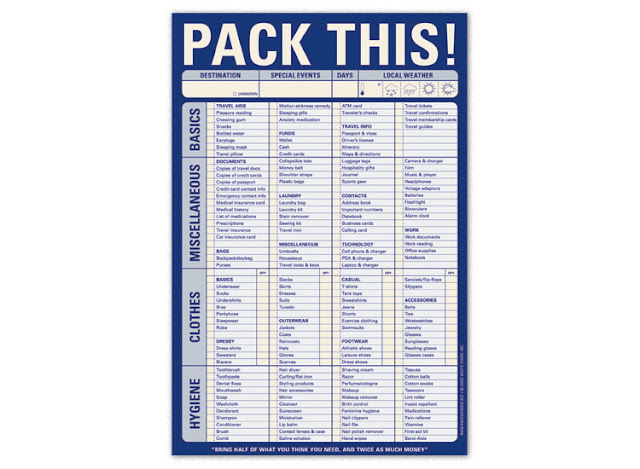 I started out my planning with a pretty slick packing list from knockknock.biz that the Easter Bunny brought me a few years back from Urban Outfitters. I was pretty doubtful that I would need everything on the list, but it was a great place to start. I used excel to create two lists, To Pack and To Buy. I ran into a challenge that was kind of embarrassing. When I was trying to estimate how much shampoo, conditioner, soap, toothpaste, etc. I would need for 10 weeks, I was completely lost. I'm not really sure when I was recently in the same place for ten weeks. I have all of my supplies for home, and then a tote with all of my travel items. So I did my best when guessing how much - any I can leave any extra stuff for the ambassadors that arrive after me. Another weird thing is I am packing food for this trip. Certainly not ten weeks of food, but a colleague who is already there recommended that I pack some easy rice and pasta dishes to take for lunch into the office. I have absolutely no intention of turning into the woman I met in India who was living off of peanut butter crackers and bottled water, but working US days means that it will be night in The Philippines, and finding lunch options at 2am isn't easy. This weekend I got about 90% of my shopping completed with a trip to Costco and Target. At Costco, I purchased most of my personal stuff (shampoo, conditioner, contact solution) and Target was the perfect stop for the rest of my personal stuff plus some groceries like easy mac and rice pilaf. I have it on pretty good authority that butter in The Philippines will be good, but that I won't like the milk; so I made sure all of the items only call for water or butter. I'm also packing a multivitamin that is high in both vitamin D and calcium. Working nights means that I'll have less exposure to the sun which will limit my natural vitamin D intake, and without a big glass of milk every day, less calcium too. After a quick trip to the doctor last week, she updated my Tetanus vaccination (which will also protect me from diphtheria and pertussis) and provided me with a prescription for a sleep aid. Its not something I'll need to rely on nightly, but I can use it to help reset my sleep pattern after that long flight. Who would have thought that I'd be this ready for my trip? I still have about 10 days left!